• Last Thursday's game with Cincinnati featured 17 kickoffs. The Tigers and Bearcats combined for nine punts and six field-goal attempts. In a game that featured 99 points and was decided by a single (late) touchdown, special teams were on the field for 32 plays. Had even one of those plays gone dramatically sour for the Tigers, the outcome may have been different. So it's less a surprise than you might think that Memphis punter Spencer Smith was named the American Athletic Conference's Special Teams Player of the Week for his contributions to a game in which his team scored 53 points. Smith averaged 52.7 yards on his six kicks, one of them a 72-yard missile that redefined "flipping the field.
" Smith followed punt-returner Roderick Proctor (Week 1) and kicker Jake Elliott (Week 3) in earning special recognition from the AAC. Memphis coach Justin Fuente has told me on multiple occasions that special teams may not win a game, but they sure can lose one. 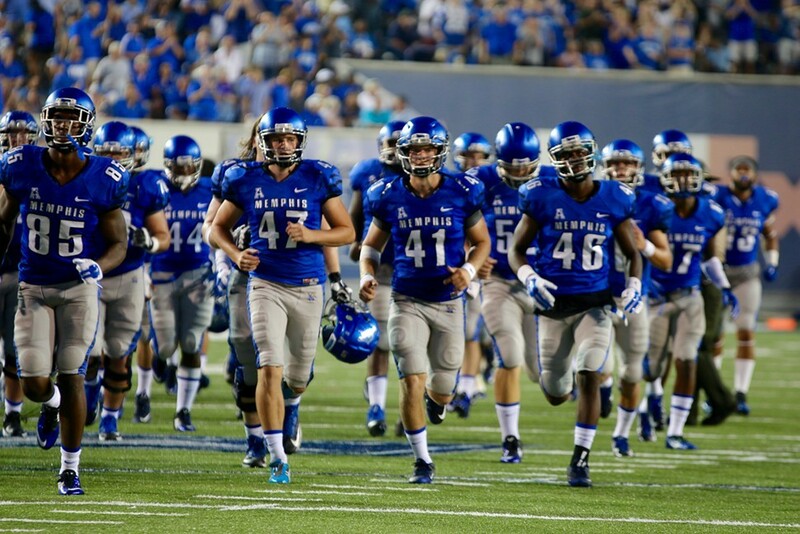 Fact is, Memphis would not be 4-0 without the play of its special teams this season. • The Memphis defense has been just this side of dreadful, especially the last two weeks. To its credit, it held late against both Bowling Green and Cincinnati to clinch victories for the Tigers. What's wrong? The answer is as obvious as the names of the Tiger defensive players are not. Eight new starters are learning their way in game conditions and have been confronted with two of the country's best offensive teams. Combine these two factors and there will be some gaps in coverage (ask Bowling Green's Roger Lewis) and video-game numbers on the postgame stat sheet (752 yards gained by Cincinnati). This is where a fan base must show trust in Fuente (and defensive coordinator Galen Scott). Surely they see something in the likes of Dion Witty (eight solo tackles against the Bearcats) and Shareef White (four solos and a tackle-for-loss) that has the players on the field in the first place. It's often said that an offensive unit needs time (and games) to gel, to find its way as an 11-man operation. Same goes for a defense. Expect progress — starting this Friday night — or changes with some of those names on the field. • I was uncomfortable with such a suggestion last season, but I'll share it now: This week's opponent is one the Tigers should handle. South Florida is coming off a bye week, but lost its last two games by 20 points (Florida State) and 18 (a Maryland team that lost to Bowling Green by 21). The Bulls average "only" 27.3 points per game (the Tigers' figure is ridiculous: 53.8). USF is second in the AAC, though, in total defense, allowing 344.7 yards per game (the Memphis offense is averaging 570.2). Tailback Marlon Mack (5.4 yards per carry) will lead the USF attack and I'm just not convinced that offense can outscore Memphis. If Paxton Lynch continues to be protected — he's been sacked only four times in four games — the Tigers have too many weapons. Look for a third straight Tiger win in this series, and a 5-0 mark for the bye week ahead of . . . Ole Miss. It's a measure of the Memphis football program's growth that a crowd of 45,172 could be drawn to the Liberty Bowl for a game — on Thursday night — that they could have watched on TV at home with the rest of the country courtesy of ESPN. And with nary an SEC foe in sight. 20-yard line — were the Tigers able to secure a program-record 11th straight victory and a 4-0 start to the 2015 season. In doing so, Memphis earned its first AAC win of the season and dropped league favorite Cincinnati to 0-2 in AAC play. "I want to thank our fans and the city of Memphis for putting on such a great show tonight," said Memphis coach Justin Fuente, whose career record is now, for the first time, above .500 (21-20). "It was a special atmosphere. We have a lot of improvement to do, on both sides of the ball. I felt lucky at halftime to only be down two points. But we found a way to get it done. Our kids showed great perseverance. There were things I didn't like: too many penalties [nine for 100 yards] and we didn't play well defensively [752 yards on 100 plays by Cincinnati]. The kids have worked incredibly hard. We're not in uncharted territory when it comes to being in battles. I'm happy that we won, but 752 yards is not something I'm proud of." Just five days after scoring 44 points in a win at Bowling Green, the Tigers extended a program-record of consecutive 40-point games to six (dating back to the end of the 2014 season). The U of M's final points of the night were scored on a three-yard run by junior Sam Craft with 53 seconds to play. After losing a fumble on his team's opening possession, Craft found some vindication by carrying on three successive plays for the final 20 yards in the Tigers' game-winning drive. "Sam's one of the first guys who came here over other places," noted Fuente. "He's from Memphis. I know he was excited to play tonight. This game meant a lot to him on a personal level. When he struggled early, I wanted him to know that we were going to come back to him, and he'd play a big role in the game. Maybe he was too excited. But I wanted him to know he's important to us. Also important to the Tiger cause is quarterback Paxton Lynch. The junior completed 24 of 36 passes for 412 yards and two touchdowns, one of them for 82 yards in the first quarter to Anthony Miller, the longest scoring strike of Lynch's career. For the season, Lynch has now thrown eight touchdown passes without an interception. He also carried the ball 11 times for a team-high 61 yards (losing nine yards on a Bearcat sack) and converted a two-point conversion that gave Memphis a 46-39 lead midway through the fourth quarter. "I told the defensive guys to just keep plugging away," said Lynch. "Like last week when we were in a shootout with Bowling Green, just get a stop, give the offense a chance. We believe in each other and always have each others' backs. We're resilient; we never give up. We'll fight to the last minute of a game." Are such games energizing for a quarterback? Or just tiring? "Definitely very tiring," he said. "And emotional, but that's how football is. You play long enough, you're bound to play in one of these games. You just have to stay locked in. The mindset is to go out and score on every drive." Cincinnati quarterback Gunner Kiel went down on a violent (but legal) hit from Tiger cornerback Chauncey Lanier late in the first quarter. He was taken to a local hospital where reports had him conscious and moving all extremities. Reserve Hayden Moore (a redshirt freshman) completed 31 of 53 passes for 557 yards and four touchdowns. Three Cincinnati receivers accumulated more than 100 yards for the night: Max Morrison (162), Chris Moore (153), and Shaq Washington (120). Over its last two games, the Memphis defense has allowed a combined 1,063 yards through the air. Dion Witty led Memphis with eight solo tackles. Reserve cornerback Arthur Maulet returned an interception 59 yards for the Tigers' first touchdown of the game in the first quarter. Miller led the Tigers with 156 yards on five catches. Roderick Proctor had 78 on just three receptions. The Tigers have scored 215 points in their first four games. The program record is 471, scored over 13 games last season. When asked about the magnitude of reaching 11 straight wins less than four full seasons after inheriting a team near the bottom of college football's barrel, Fuente deferred such a big-picture view. "I have a hard time with that," he said. "I'm happy for the program, but for me, it's about the season. I know how many difficult challenges we have ahead, and how much better we've got to get to win just one more game. I'm proud of it, but I'm kind of a small-picture guy. We're trying to focus on just one at a time. The bottom line is we're 1-0 in the conference and now we go to South Florida next week." • When does a rising college football coach become a star college football coach? I think we saw the moment(s) for Tiger coach Justin Fuente Saturday afternoon at Bowling Green. Games are won by talented players, Fuente would be the first to tell us. But the guy on the sideline with a headset over his white cap did as much to win Saturday's shootout as any player . . . because he created winning scenarios for those players. In a game dominated by two offenses, a coach with a background in play-calling (a former college quarterback, no less) can make an imprint in ways he couldn't on the defensive side of the ball (where performance is defined as much by the way players react as it is by scheme). Midway through the third quarter, the Tigers had the ball in Falcon territory, near (if not already inside) the range for all-conference kicker Jake Elliott. Down 27-20 and facing fourth down with a yard to go, Fuente's decision to go for it wasn't all that surprising. The Tigers have treated fourth down like an opportunity to advance the ball since Fuente's arrival in 2012. What was surprising was Tiger quarterback Paxton Lynch dropping back to pass . . . and finding Tevin Jones for 32 yards, setting up a Sam Craft touchdown run that tied the score. It was a tremendous gesture in trust from coach to players (and not just trust in Lynch), and a bold statement that the Tigers will not be timid in their attack. Then, of course, there was the double-reverse flea flicker two possessions later, a play in which four players touched the ball (Lynch twice) before Jones entered the end zone to tie the game at 41. That was recess football, the kind played with a Nerf ball, a team desperate to tie (no, win) a game before the bell rings and classes resume. The Tiger linemen held their blocks impossibly long, the Tiger skill players executed with precision, and the Tiger coach looked like he expected nothing less from his undefeated team. It was a play with star power, crafted by a star coach. 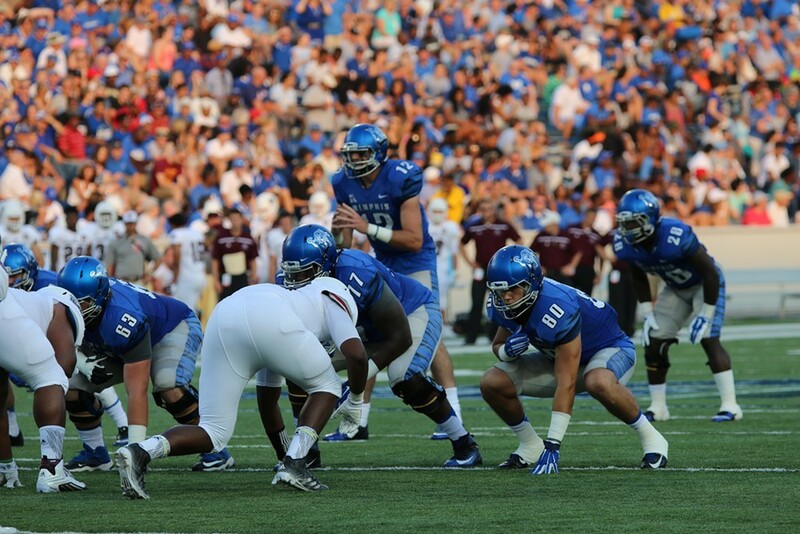 • Speaking of stars, Paxton Lynch is setting a new standard for quarterbacking at Memphis. In an offense Fuente insists is set up on the ground, Lynch put on an aerial display at Bowling Green that will have defensive coordinators — starting with Cincinnati's — rewinding clips all season. He completed 29 of 40 passes (72 percent) for 386 yards, three touchdowns and no interceptions. For the season, the junior has completed 77 percent of his passes for 818 yards, six scores and no picks. (If you pay attention to passer rating, Lynch's was sparkling: 191.6.) Oh, and Lynch carried the ball seven times for 30 yards against Bowling Green, somehow making him even harder to defend. He's bound to regress, if slightly, as the season grinds on. But with the number of targets at his disposal — eight Tigers caught at least three passes last Saturday — Lynch is on his way to the kind of season that ends at award shows. • Thursday night should feel like a main event at the Liberty Bowl. The Tigers will aim to reach a 4-0 record for the first time since 1961 and become the first Memphis team — ever — to reel off 11 straight victories. The game will be televised nationally by ESPN and the visitors are the preseason favorites to win the American Athletic Conference championship. The matchup with Cincinnati could actually be a preview of the first AAC championship game (December 5), as the Tigers are favorites to win the league's West division. The Tigers have averaged 570.3 yards of offense and surrendered an average of 354.3 yards in their first three games. The figures for Cincinnati are virtually the same: 579.3 and 330.0. Memphis has faced no AAC foe more often than the Bearcats, holding a 19-13 edge in a series that began in 1966. Cincinnati coach Tommy Tuberville remembers last year's 41-14 Tiger win in Ohio, a game in which quarterback Gunner Kiel completed only 11 of 27 passes. Should the Tigers put up a similar score Thursday night in front of a crowd nearing 50,000 (could that happen? ), it might go down as one of the top Memphis wins in Liberty Bowl history. In a game that saw two teams combine for 85 points and 1,124 yards of offense, the Memphis Tigers scored last — on a 29-yard field goal by Jake Elliott — to secure the program's first 3-0 start in 11 years and the first 10-game winning streak (dating back to the 2014 season) in more than 50. Junior quarterback Paxton Lynch completed 29 of 40 passes for 386 yards and three touchdowns (and no interceptions). Lynch's heroics were just enough to offset those of his Bowling Green counterpart, Matt Johnson, who completed 28 of 44 attempts for 447 yards and four touchdowns, three of them to Roger Lewis who hauled in a total of seven passes for 261 yards. The Tigers have now scored at least 40 points in five straight games, a first for the program. Lewis caught the first of his three lengthy touchdown passes with just 1:16 expired in the first quarter, setting the tone for an afternoon in Ohio that left two defenses winded and weary. A Lynch pass to reserve tight end Daniel Montiel gave the Tigers a 17-14 lead with 9:40 to play in the second quarter, but Johnson scored seven minutes later to regain the lead for Bowling Green. The Falcons would not trail again until Elliott's game-winning kick. Memphis tied the game three times after halftime, trading touchdown drives with the Falcons. Sam Craft ran for a three-yard score with 5:15 left in the third (after a 32-yard completion from Lynch to Tevin Jones on fourth down) to even things at 27. After Lewis countered with a 94-yard touchdown reception, Craft took a midrange pass from Lynch and ran 60 yards to again tie the game (34-34). Early in the fourth quarter, Lewis caught a 62-yard strike from Johnson to give Bowling Green a 41-34 lead, which merely set up the play of the game. With just under 12 minutes left on the clock and the ball at the Falcon 48-yard line, Tiger coach Justin Fuente called a double-reverse flea-flicker — a play in which four players touch the ball, one of them twice — and Lynch found Jones across the middle for the Tigers' fifth touchdown of the day. Amid all the offensive fireworks, the game was actually decided by the Memphis defense, which held the Falcons scoreless on their final three possessions of the game. Junior cornerback Arthur Maulet deflected one final heave from Johnson toward Lewis to clinch the victory with just over a minute left to play. Doroland Dorceus led the Memphis ground attack with 75 yards on 16 carries (and a touchdown). Jones compiled 98 yards on his three receptions while Mose Frazier caught seven passes for 66 yards. The last 10-game winning streak for the Memphis program began with Dwight D. Eisenhower in the White House (in 1960) and ended with John F. Kennedy in the oval office a year later. The Tigers will have a chance to extend the country's third-longest winning streak next Thursday when Cincinnati comes to town for the U of M's first American Athletic Conference clash of the season. The Bearcats improved to 2-1 Saturday with a 37-33 win at Miami-Ohio. • Only two college football programs in the entire country — Ohio State and TCU — have longer current winning streaks than the nine-gamer the Memphis Tigers are riding. Had I suggested in 2013 that such a sentence would be written in 2015, my keyboard would have been confiscated. ("No more 'Three Thoughts' for you!") The last time Memphis reeled off 10 straight wins predated construction of the Liberty Bowl, a streak that began with the last four games of the 1960 season and continued through week six of the 1961 campaign. (The Tigers beat Abilene-Christian twice during that streak.) And how rare is a 2-0 record in these parts? Going back a half-century (to when the Liberty Bowl opened in 1965), Memphis has opened a season with two wins just six times: 1967, 1973, 1976, 2003, 2004, and now 2015. Only two of those starts reached 3-0 (’73 and ’04). Embrace the novelty of it all, Tiger fans. Of course, the teams also have to play defense this weekend. A Memphis defense breaking in eight new starters has yielded an average of 242 yards, but to notably weak competition. Bowling Green's defense has surrendered an average of 472.5 against a pair of Power Five teams. Memphis has an edge with its ground attack (as it will most of the season). If the Tiger offense can gain traction with its tailback-by-committee approach, Johnson and friends will have less time to sling the football downfield. It's a game where the time-of-possession figures may actually matter. The last time these programs met — in the 2004 GMAC Bowl — they combined to score 87 points. • It's never healthy to look beyond the next game, but the Tigers need to stay healthy (win or lose) this Saturday. Just five days later, Memphis will return to the Liberty Bowl to face Cincinnati, favorites to win the American Athletic Conference championship (but losers last weekend to Temple). No 2014 victory meant more to the Tigers than the upset they earned at Cincinnati, a win that made sharing the AAC trophy (with Cincinnati and UCF) possible. Mark this down: If the Tiger coaching staff (and players) were told they could do no better than split this two-games-in-a-week stretch, they'd take a win over the conference rival. Say what you will about the quality of their first two opponents, but the Memphis Tigers are off to a drought-ending, history-making start to the 2015 football season. By thoroughly beating Kansas tonight in Lawrence, the Tigers earned their first win over a team from one of college football's "Power Five" conferences since beating Ole Miss in 2004. Their combined point total — after scoring 63 last week against Missouri State — marks the first time since the program was founded (1912) that Memphis has exceeded 100 points in its first two games of a season. (The 2010 Tigers scored 173 points in 12 games.) Perhaps best of all, the Tigers find themselves 2-0 for the first time since winning their first three games of the 2004 campaign. Memphis fell behind early, 10-0, Kansas taking advantage of a Sam Craft fumble at the Tiger 10-yard-line (converting a field goal), then driving 73 yards in just 1:25 before tailback Ke'aun Kinner reached paydirt. But Craft scored on a one-yard run of his own with 6:26 to play in the first quarter and Jake Elliott connected on a 27-yard field goal to tie things with 2:28 left in the period. The Tigers took control with a pair of second-quarter touchdowns scored by Doroland Dorceus (his third of the season) and Tevin Jones. Junior quarterback Paxton Lynch was close to flawless, completing 22 of 25 passes for a career-high 354 yards and two touchdowns. Senior wideout Mose Frazier caught four passes for 77 yards while also rushing for 64 yards, 50 of them coming on an end-around he took to the end zone early in the third quarter. Jamarius Henderson led the Tigers on the ground with 77 yards on 11 carries. Overall, the Tigers piled up 651 yards to 359 for the Jayhawks. The Tigers travel to Bowling Green next week. The Falcons enjoyed their own road blowout today, winning 48-27 at Maryland after losing their season-opener at Tennessee. Over the three seasons before Fuente arrived (2009-11), the Tigers averaged 23,263 for home games. The empty seats were a direct reflection of miserable play on the field, the collective sense being a program could be dying right before the (precious few) eyes of its most devoted fans. Now, you'd be surprised if the Tigers don't have 40,000 in the seats on September 24th when a rival for the American Athletic Conference championship (Cincinnati) comes to town for a Thursday-night tilt. In a half-century of football at the Liberty Bowl, Memphis has averaged 40,000 fans only three times: 1976, 2003, and 2004. (The latter two were at the height of DeAngelo Williams's college career, and the average his senior year — 39,991 in 2005 — fell just short of the mark.) Football season has arrived for the University of Memphis. • Considering the shortcomings of the Tigers' opponent Saturday night, I'll refrain from measuring individual performance until Memphis takes the field this Saturday at Kansas. (If Missouri State had 63 players in uniform — the limit for FCS programs — the Tigers had 130.) But the most inspiring sight in the lopsided Tiger win was actually multiple sightings of tailbacks landing in the end zone. Doroland Dorceus and Jarvis Cooper each scored a pair of touchdowns, the latter gaining 102 yards on just 18 carries. Add Sam Craft to the mix (72 yards on 12 carries) and freshman Jamarius Henderson (73 yards on 15 carries), and the Memphis offense has four sturdy wheels for an offensive machine set up more for lengthy strikes than the quick variety. With holes carved by a veteran offensive line and multiple targets downfield for a veteran quarterback (freeing up space beyond the line of scrimmage), I don't see a ceiling for the Tiger ground game. Should the Big 12 expand in the near future to 12 teams (imagine that), Memphis wants to be on the radar. The Tigers' performance in Lawrence could help create a blinking red dot that grows into something larger than mere distraction on that radar screen. How best to motivate a heavily favored team? If I were Justin Fuente, I'd find time to run a clip of a certain basketball game played on April 7, 2008. Most of the current Tigers were in middle-school (or younger) when Mario Chalmers broke a region's heart. They play for that region now, though, and aim to become the first Memphis team in 11 years to open a season 2-0. Gloves off.